In 25 t0 28th of June, Valentin Tinc was invited as a guest speaker to Pune, India. This design event was organized by A&I Digest from Pune and its president Amit Danait. Tinc was invited to share some of his professional achievements in front of 180 architects and interior designers from the city. During his stay there, he visited several business and explored the possibility of holding kitchen design workshops in India. Never too late to change your life! Marco Fumagalli 1969, graduated in Architecture in Milan in 2000. After a period devoted to teaching at the same institute, he began his professional career in 2001, and thus comes MARCARCHSTUDIO based at "Villa Frua 'Stresa, Lake Maggiore. The desire to assert their vision of Architecture is the basis for the choice of building a structure capable of developing projects with a high added value. The objective of the project is an idea of ? ?housing that allows overcoming the limitations of the traditional relationship end user - designer / architect. The commitment is active in various sectors: residential architecture, with the development of several housing projects, all exclusively tailored interlocutor, in the design of public spaces, bars, clubs, retails, wellness centers. A special mention deserves the design of exhibition stands, thanks to the collaboration with major companies (including Scirocco, Stokke, Hitachi, Nemo-Cassina, Florida, Paglieri Sell System) it was possible to project very articulate with a high visual impact. To complete the range of services offered by MARCARCHSTUDIO: the strategic development of projects of Corporate Identity, Web Design and Art Direction.From interior design to product design: collaboration in the field of industrial design today is extended to various companies in the furniture industry. The adventure of industrial design, begins only in 2005, today the collaboration was extended to several companies, in chronological order: Scirocco, Bruno Milan, Valentini Upholstered Berloni, Titan Upholstered Bimax, Martex, Giellesse, Cierre, ArteRovereAntico, Formal, Halls, Roche Bobois, Willisau ag, Omporro, CitterioLine. In some cases, the collaboration was extended to the art direction, this new opportunity has allowed us to integrate the project design to pure business logic and presentation of the market, with the Scirocco since 2003, with Berloni from 2007 to 2009, with Florida since 2009 was possible to build an integrated project that is bringing its fruits to all actors involved. Design dall'imbottito, to accessories, to programs, to enlightenment, however, is the recent collaboration with the company Halls, an industry leader that will lead to the birth of a new series of fireplaces with natural gas, for a complete experience 360 °, in the field of architecture and design. The Hanex® solid surface consists of two-thirds rock mineral and one-third methylmetacrilate and is a resistant and uniform material throughout its depth: it comes in a 6-mm and 12-mm thickness. Hanex® can be used for residential and commercial applications and offers endurance, beauty and limitless design flexibility. With it you can create unique solutions in any type of environment, even in the hospital/healthcare sector thanks to its hygienic and sanitary characteristics. Hanex is the best Solid Surface for thermoforming. 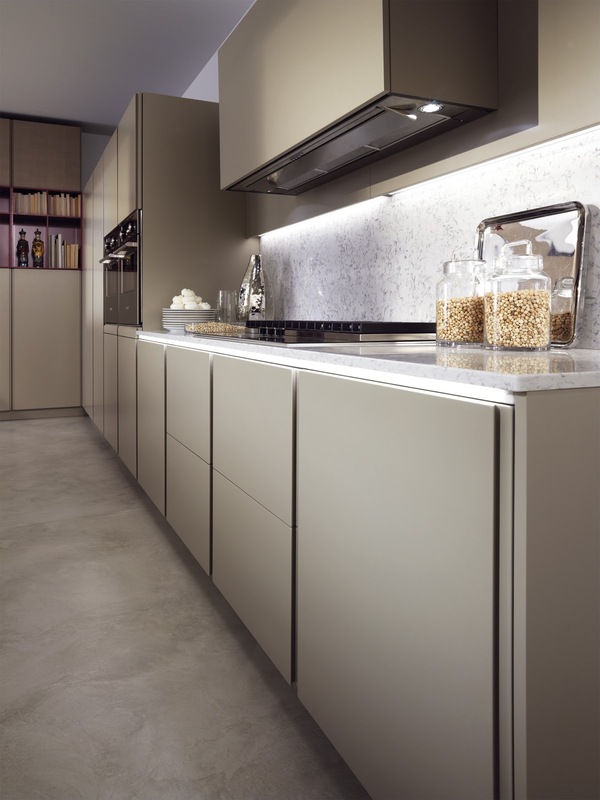 The Biefbi Company was born from the family Battistelli's experience in the furniture sector and since 1976 it is specialized in the industrial design and production of fitted kitchens. Over the years, thanks to the encounter and collaboration with designers, architects, photographers and artists, Biefbi has managed to interpret many different products but, at the same time, they have a common important point: the pursuit of design and the application of best technologies. The Kitchen . The space where we meet our most affections. A multifunctional environment in which distinct areas mark the phases of a daily ritual : wash, bake, prepare, store . A large table to sit and eat. Capri is a combination of different materials such as oak effect “Cutting Saw ” and color ” tone on tone ” A minimalist and professional configuration obtained through the purity of the lines and the technological character of Capri. 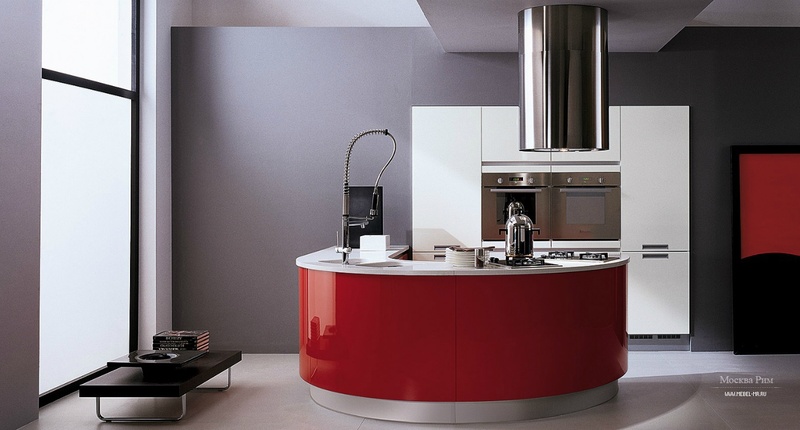 The door thick is the interpreter of the character of the contemporary kitchen , design element unique Biefbi in which the opening is drawn by two crisp vertical lines . The wood , pleasant to the touch , elegant and refined colors. A kitchen that gets the maximum visual impact with the use wise use of materials and the clear approach of volumes and contrasts color . Ante bases are made of veneered solid Ebony with fine wood . Ante thick on which it is obtained the handle vertically. Worktop in Corian ® integrated basins and cooking single items collected in filotop . The wardrobe is in glossy polished . The hood Star Propeller is a “jewel” that gives the whole a bright elegance. Far far away in a land where home seems distant and the drive feels long is a place we call the office. The standard 9-5 job seems to be disappearing fast and many people are finding themselves eating lunch and dinner in office. It’s not exactly a healthy practice since desks are usually infested with more bacteria than the kitchen. 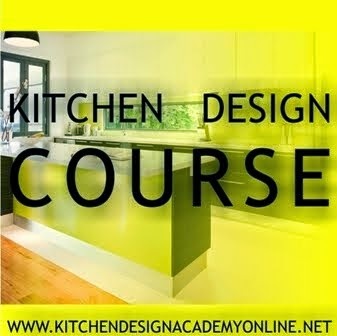 So designers Simon Kingston and James Rennick decided to make that their challenge when German kitchen and appliance manufacturer Miele asked them to come up with an idea for the kitchen of the future. Their design consists of 2 specially designed boxes. They’re proportioned to fit a number of Miele appliances and can also be used as storage. The goal was to keep these temporary kitchens modular so they could fit into any environment. 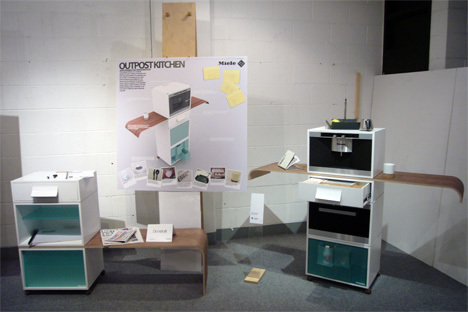 They also designed attachments that can extend the kitchen’s usefulness by adding additional table tops and seating. Of course I see nothing wrong with eating at your desk. If you’re worried about health, hey, clean your desk once in awhile. I personally like to surf the internet while I eat or watch television. Don’t you? Setting up a new kitchen for use by a couple who cook together requires deft space planning. It also helps if there is two of almost everything. 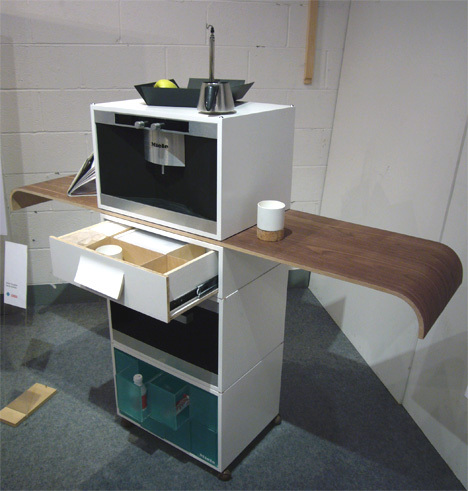 This responsive kitchen is by Darren James. The owners wanted a design that would bring the colours and textures of the outdoors inside. They also requested a layout that would let them both prep and cook without getting under each other's feet. A modest home office was to be another aspect part of the renovation. It was decided to position a new pantry and the study at the end of the kitchen, says James. "We found the extra space by appropriating a bedroom that sat a few steps higher. Ceilings were aligned and new flooring was laid to match the existing kitchen floor. "A lot of the planning was based on the way the couple operate together. In response, I designed a large peninsula with two identical prep stations. Each has its own butcher's block, sink, and an electronic pop-up utility station for knives, spices and oils. 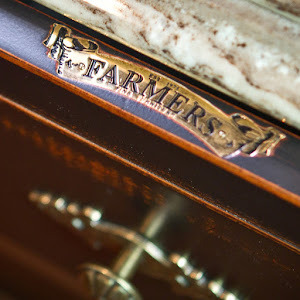 Both areas have drainage grooves routed into the benchtop to prevent water getting to the cooktop or pop-ups. "A separate stainless steel workstation on the wall behind is used for larger prep jobs." The design separates the cooking options, again for easy use by two. A hob is in the island, ovens are on the perimeter wall, and a deep fryer and teppanyaki plate are in the scullery. To bring in a sense of the natural world, James chose marble cladding for the peninsula and avocado-coloured tiles for the splashback. The designer also introduced a panel of stacked solid cedar, stained in Half Walnut, adding texture and creating a warm, inviting nook for the home office. However, with double prep stations, many cooking options and the stainless steel rear benchtop, the kitchen itself has a semi-industrial feel. The pantry features stainless steel and cedar open shelving, adding to this impression. EISNO Lifetech Appliances is a domestic kitchen appliances brand founded in Italy.The EISNO continuely offers a full range of products with prosperous decades of professional experience in kitchen appliance and manufacturing to oceanic users to launch high-end brands 's quality ,product concept and fast service.The manufacture center composed with three subsidiaries: appliance factory, injection Factory and molding factory based in China. 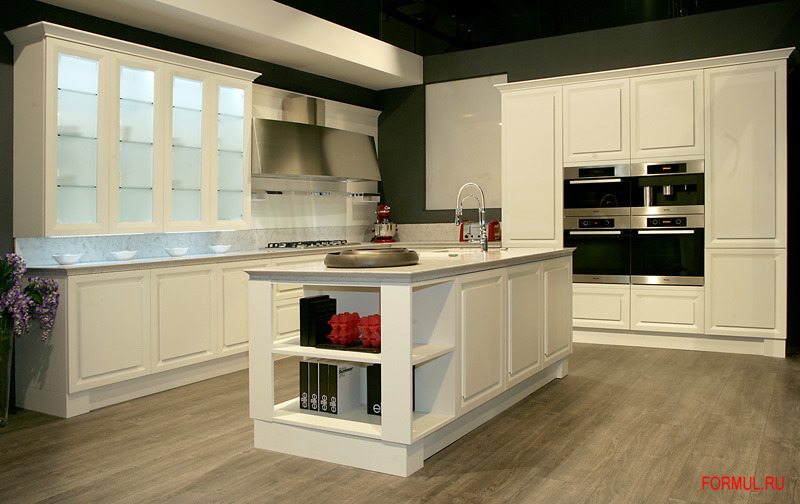 With Decades' development ,now the factory is one of the largest production bases of kitchen appliance in Asia. The cooperation is moving more and more to the local key brands and distribution channel. The product exported to more then 40 countries. EISNO is a Italian joint-venture company. EISNO Kitchen appliance is originaly Itailan design,and remarkable quality with strict Italian manufacture standard system. For the first time, based on an idea of the architect Mauro Carlesi, Toncelli introduces carbon fiber. Not as a finish for an already existing unit, but as an out and out structure, that finds its perfect element for both peninsula and hanging wall units.